Columbus, Ohio—June 9th, 2018—It was a tale of two halves for the New York Red Bulls on Saturday afternoon at MAPFRE Stadium as Jesse Marsch’s side earned a 1-1 draw against the Columbus Crew. The draw keeps the Red Bulls in fourth place in the MLS Eastern Conference with games still in hand on all three teams ahead of them in the standings. The match was the third of four games in the next 12 days before the international break for the FIFA World Cup in Russia, and for the first half at least, the tired legs of the New York players were definitely on display. For the first half of the match, New York’s players found themselves in a very unfamiliar position. Not only were they outplayed, which can happen in any soccer game, but they were out worked, something very unfamiliar to fans since the takeover of Jesse Marsch. 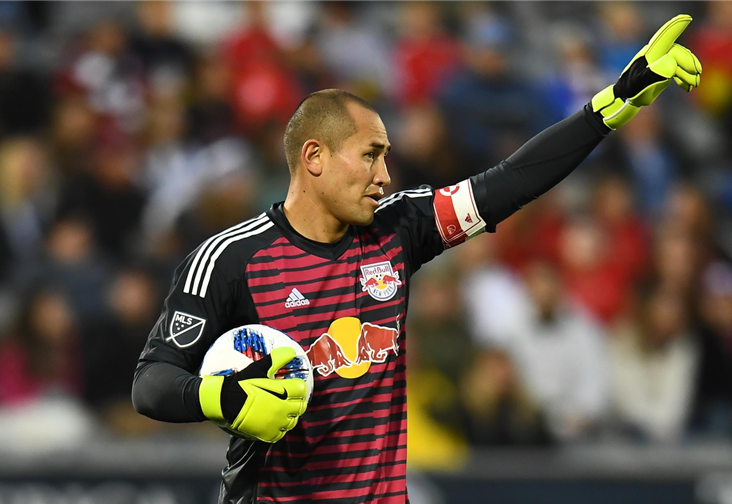 One positive for the Red Bulls was the return of ironman goalkeeper Luis Robles who had missed the last 3 games, replaced more than adequately by backup Ryan Meara who earned a 1-1-1 record in MLS play as well as a US Open Cup win over NYCFC. Robles would be tested early and often in the first half by an aggressive Columbus Crew. The Crew would attack right from the opening whistle when USMNT striker Gyasi Zardes just missed burying a cross from the right in the third minute. Robles would make his first big save eight minutes later saving a powerful shot by Crew midfielder Artur. Three minutes later, a stunning free kick by Pedro Santos left Robles helpless but smacked the shot off the crossbar much to the relief of the Red Bulls keeper. The troubles in the midfield would only be compounded in the 18th minute when Vincent Bezecourt went down with an injury and had to be replaced by Marc Rzatkowski. Columbus would deservedly get its breakthrough goal in the 26th minute when Harrison Afful send in a cross to an open Zardes who easily headed home the ball past Robles for his 10th goal of the season. The former LA Galaxy striker almost got his second 10 minutes later only to have his shot stopped by Robles at point blank range. Artur would try his luck again in the 40th minute, firing another powerful shot at goal from long range. But the Red Bulls keeper was up to the task again, tipping the ball over the bar to keep the Red Bulls in the game but still trailing at halftime. Three things were abundantly clear when the second half kicked off. First, the difficulty of the MLS schedule was on display, and between the heat and playing their third game in seven days, the Red Bulls looked exhausted on the pitch. Second, the Columbus midfield had completely neutralized the New York strategy of high pressure and counter-attacking style. The visitors had been completely outmatched on the field. And finally, whatever was said by Jesse Marsch in the locker room at halftime had a profound effect on the squad as a completely different Red Bull team emerged in the second half. New York attacked immediately in the second half with Bradley Wright-Phillips providing the first good look at goal with a deflected shot just a minute in. The visitors first shot on goal would not come until the 49th minute with a shot from the top of the box by Alex Muyl denied by Columbus GK Jon Kempin. The New York City native, who has received his fair share of criticism this season, would get the Red Bulls on the board in the 57th minute when a free kick from the right by Rzatkowski found the head of a leaping Muyl to level the match at 1-1 for his second goal this season. New York almost turned the match on its head when Daniel Royer fired a shot from the edge of the penalty area that was just tipped over the bar by Kempin. The home side pushed hard for a winner in the last five minutes, but the New York backline did not break and were able to hold on for a point and a 1-1 draw. It will be a quick turnaround again for the New York Red Bulls as they return home to Red Bull Arena on Wednesday to take on the Seattle Sounders. Fortunately, reinforcements are on the way for a stretched Red Bulls team. Midfielder Tyler Adams and defender Tim Parker will be returning after representing the United States in their recent friendlies against Ireland and France for what will be the fourth match in a week and a half. But with Wednesday being one of the Red Bulls games in hand, a win will be critical to keep them at the top of the standings in the Eastern Conference.